Mongolia is vast! Approximately the size of Western Europe yet there are only 2.8 million making it a spectacular destination for those wanting to feel at one with nature. A visit to the Gobi Desert will certainly accomplish that. Take in the history in the land of Genghis Khan await an intrepid traveler. 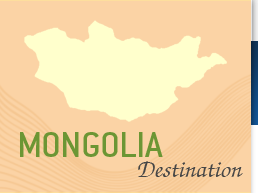 Mongolia developed as a nomadic culture with little interest to interact with other cultures of northern Asia. At the beginning of the 12th Century the Mongols were united by a 20 year old named Temujin. In 1189 he was given the name Genghis Khan meaning “universal king”. He founded the Mongolian empire which became the largest empire in history after his demise. He invaded and conquered most of China and central Asia, his descendants went on to stretch the empire to include most of Eurasia including Eastern Europe, Russia and the Middle East. Genghis Khan also advanced the Mongol Empire adopting Uyghur script and promoting religious tolerance. The Manchu or the Qin Dynasty took over Mongolia from the late 17th century till the 20th century. In 1911 Mongolia announced its independence and faced with an invasion from China aligned itself towards Russian socialism and reform. With the help of the Red Army China is forced out of Mongolia and in 1924 The Mongolian People's Republic is proclaimed. With the formation on of the Soviet Union in 1922 all religious activity was banned in Mongolia and many monks were executed. During the Second World War Mongolian and Soviet troops defeated the Japanese and a close relationship formed between Mongolian and the Soviet Union. The second branch of the trans Siberian railway was contrasted across Mongolia between 1949 – 1955 which linked Russian, Mongolia and China. In the 1990s religious freedom has returned and religious revival is on the increase and a new constitution was written and democracy finally arrived. Mongolia now has a rapidly growing economy with in fact the largest growth in the world in 2012. Mongolia has about 2.4 million inhabitants, with only about 1.66 inhabitants per square kilometre making Mongolia the most sparsely populated country on earth. 85 % of the population is Khalkha Mongols. Buryat, Tuva, Kalmyks belong to the Mongolian minority. The most important non Mongolian population with 7 % is the Kazakhs, who are just like the Uriankhay (1.3 %) to the Turkic peoples. The most common religion is Mongolian Buddhism. In recent years, especially in the big cities, churches and various Christian sects gained influence. The Kazakhs are predominantly Muslim. The official language is Mongolian and until 1990 Russian language was a second foreign language. Today English is recognized as a second official language. There are plenty of holidays in Mongolia but the two that are celebrated the most are the Traditional Mongolian Lunar New Year and the Naadam Festival. Tsagaan Sar or White Month is one of Mongolia's two major and long-awaited holidays. For Mongols, Tsagaan Sar is not only an ancient holiday marking the end of winter and the beginning of a new year's cycle, but is also a time for unification and reinforcing social bonds. Preparation for the festivities start early, several families usually gather in the eldest man's ger, where the holiday will take place. Since the holiday means all relatives, neighbours, friends and guests are treated to a lavish meal, women make buuz and dumplings. Families all across the country stock-up on food, dairy, mild milk vodka and other specialties for the occasion. The Naadam festival is the biggest and most joyful celebration for Mongolians. It takes place on the 11-12th of July each year. The festival originated from the era of Khunnu Empire and was originally organized as a competition to test the skills of Mongolian Warriors of different tribes. The festival comprises the "Three Manly Sports": wrestling, horse racing and archery. A fascinating and interesting event for all is where the 9 White Flags of Chinghis Khan are carried in a ceremonial parade from the State Parliament House to the Central Stadium. 512-1024 wrestlers compete on the green field of the State Central Stadium-there is no time limit, no weight category. There are 6 different categories of horse racing depending on the age of horses. Archery, originating, is the oldest sport of the Mongols. Traditionally, this was only men's sport but nowadays both men and women compete in separate divisions. This Naadam festival is organized for those who came late for Naadam festival. Taking place at the Khongor sand dunes - the Gobi Desert "Khongor" Naadam is the pride of the Gobi people. Competitions are held in the Three Games of the Mongols - archery, horse racing and wrestling with music and dance played throughout the day. A tourist visa valid for 30 Days can easily be obtained from the Mongolian Embassy in the UK applying in person or via an immediate family member with the completed application form and travel itinerary and one passport size photo. Payment cannot be made in cash so you will need to deposit the appropriate fee by bank transfer and bring receipt of payment. The Visa Fee is normally £40 pounds for a 2-5 day Visa or £60 pounds for a one working day visa. Medical facilities in Mongolia are very limited and do not meet most Western standards, especially for emergency health care requirements. The majority of medical facilities are located in Ulaanbaatar and Medical facilities and treatment are extremely limited or non-existent outside of Ulaanbaatar. SOS is widely regarded as Mongolia's most modern medical facility. There are English-speaking doctors, but the clinic isn't equipped for surgical procedures. Songdo Hospital is operated by a Korean chain of clinics and hospitals and, like SOS, has English-speaking doctors and is the only clinic that has medical evacuation services in Mongolia. The Mongolian currency is the Tugrug (T or MNT) which is available in denominations of 1, 3, 5, 10, 20, 50, 100, 500, 1000, 5000 & 10,000 Tugrug Notes. Coins are beginning to become into circulation and are in denominations of MNT 20, 50, 100 and 200. Most banks and the larger hotels in Ulaanbaatar are able to change most currencies, although US Dollars are the most widely accepted. It is also possible to change traveller’s cheques and get cash advances on your credit card. American Express, VISA and Mastercard are the most widely accepted. Electricity in Mongolia is 220 volts; this means for those arriving from the UK you will not need a Voltage adapter. You will probably need an adapter as most plugs in Mongolia have 2 prongs. Tipping - Tipping in restaurants, bars and cafes is not expected although, as more and more tourists are providing tips, the staff are of course very appreciative. Most places will charge a 13% sales tax on top of their menu prices so be aware of this. If you wish to leave a tip, 10% of your total order is a very reasonable amount. If you don’t want to use roaming take a spare old phone sim cards are cheap in Mongolia and you can use them instead of being charged international roaming rates!